Free Arts for Abused Children of Arizona Celebrates 25th Anniversary. Free Arts for Abused Children of Arizona kicked off its 25th Anniversary celebration with a Gala on Saturday, Oct. 20, at the JW Marriot Camelback Inn Resort & Spa. 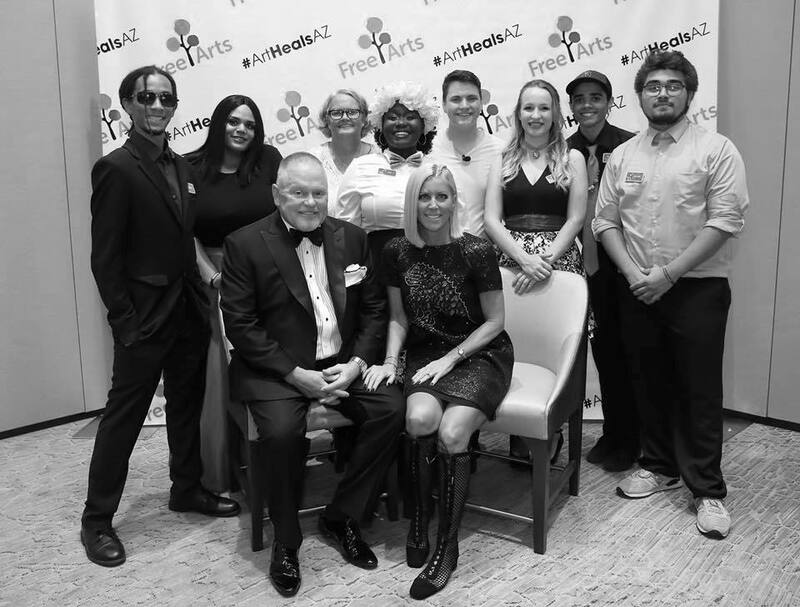 More than 300 supporters attended the event where Bob and Renee Parsons were honored for their many years of transformative gifts to Free Arts. Presented by APS, Free Arts’ 25th Anniversary Gala raised a total of $1,358,066 to support programs that use art and mentorship to transform children’s trauma into resilience. During the evening, the Parsons surprised Free Arts with a $1.1 million donation, $1 million to go toward renovation of the new Free Arts building and $100,000 to support Free Arts programs. The Parsons have been longtime supporters of Free Arts and through The Bob & Renee Parsons Foundation have granted more than $4 million to the organization over the past six years, including this most recent gift. In August 2017, The Bob & Renee Parsons Foundation awarded Free Arts a $2.5 million grant to double the organization’s physical space on Camelback Road and establish The Bob & Renee Parsons Center for Hope and Healing, expanding programming and reaching children Free Arts had previously been unable to serve. Free Arts was founded in 1993 and served 50 children; in 2018 it served more than 8,000 children. Free Arts had five volunteers in 1993 and this year it has more than 800. The number of partner agencies has grown tremendously in 25 years – starting in 1993 with only five, to today’s 43 partners. The children served by Free Arts have experienced combinations of family trauma, homelessness and violence. To help build resiliency and begin the healing process, Free Arts provides mentoring, a caring community and an opportunity to express themselves and learn new skills. To learn more, visit FreeArtsAZ.org.